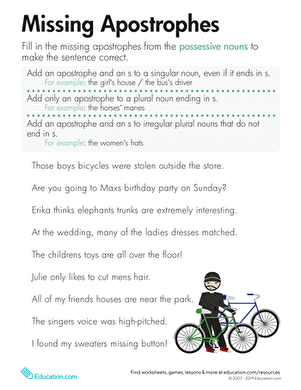 Students will be able to correctly use possessive apostrophes with singular and plural nouns. Draw a large apostrophe on the board: the kind with a circle and a curled tail, not just a vertical line. Tell students that this curly symbol has many uses in the English language. Ask students to turn to a neighbour to think of two uses. Share out the uses of the apostrophe (for example, contractions, possession, slang, deleted letters) and give some examples of each. Explain that although possessive apostrophes seem tricky, there is basically one simple rule that applies. Distribute the Possessive Apostrophe ReviewWorksheet. Review the rule as it is explained on the sheet. 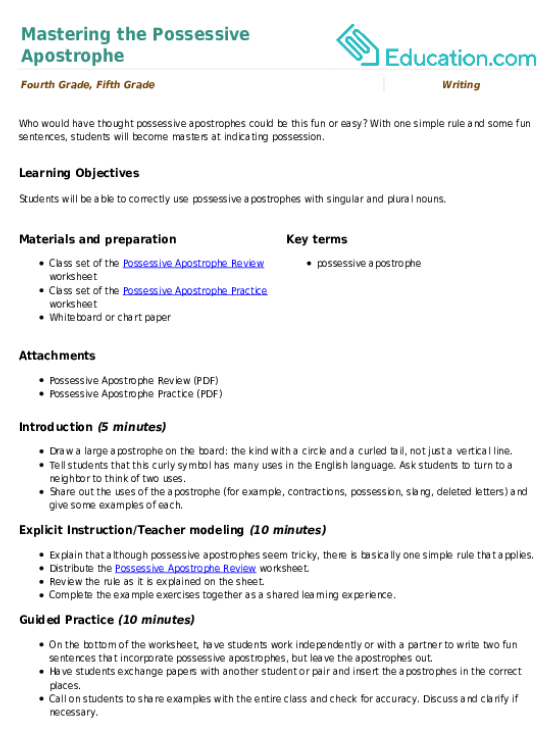 Complete the example exercises together as a shared learning experience. 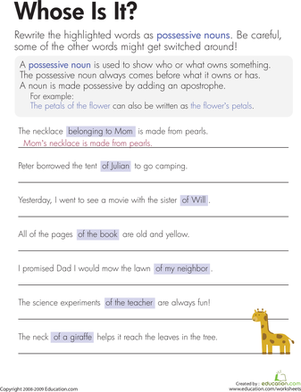 On the bottom of the worksheet, have students work independently or with a partner to write two fun sentences that incorporate possessive apostrophes, but leave the apostrophes out. Have students exchange papers with another student or pair and insert the apostrophes in the correct places. Call on students to share examples with the entire class and check for accuracy. Discuss and clarify if necessary. Distribute the Possessive Apostrophe practiseWorksheet. Review instructions together and answer any questions. Instruct students to complete the exercises independently. Go over the correct answers and call on students to share their examples again. Support: Put a large cardstock “arrow-like” apostrophe on a magnet to use on the whiteboard. Write short phrases that require possessive apostrophes (for example, "mans computer," "horses tail," "kids tricycles"), using the card stock apostrophe as a manipulative. Enrichment: Have students research how to handle instances of the possessive apostrophe with nouns that end in double S, like PrincessOr Boss, then report back to the class. Write one or two example sentences on the board or on chart paper. Each sentence should require at least one possessive apostrophe. Have students write only the word that requires the apostrophe, with the punctuation inserted. Discuss: What would happen if we didn’t have possessive apostrophes? Can you think of uses of possessive apostrophes that are tricky? Why are they tricky? 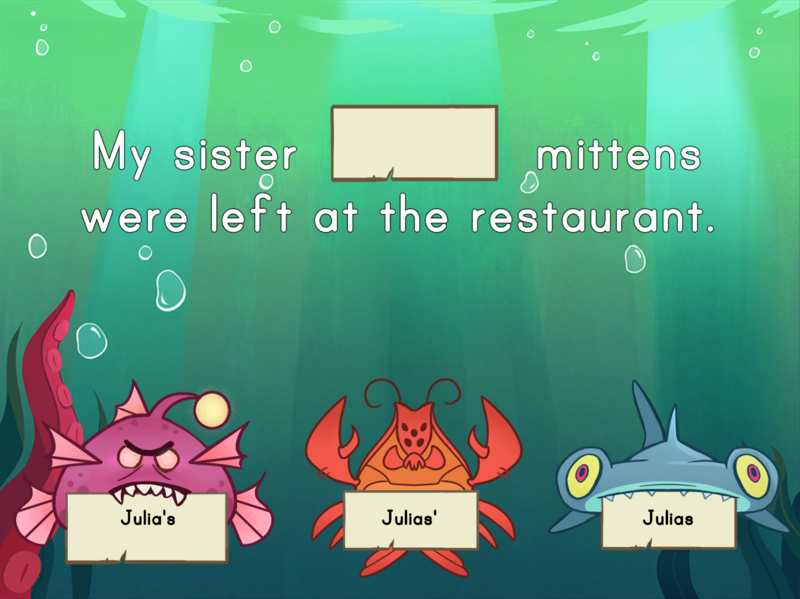 Help improve the fluidity of your students' written pieces by introducing them to possessive nouns. Helpful hints encourage your students to think through problems in order to solidify the lesson.